A Set of Easy Mass Producing Taylored Expressions cards! 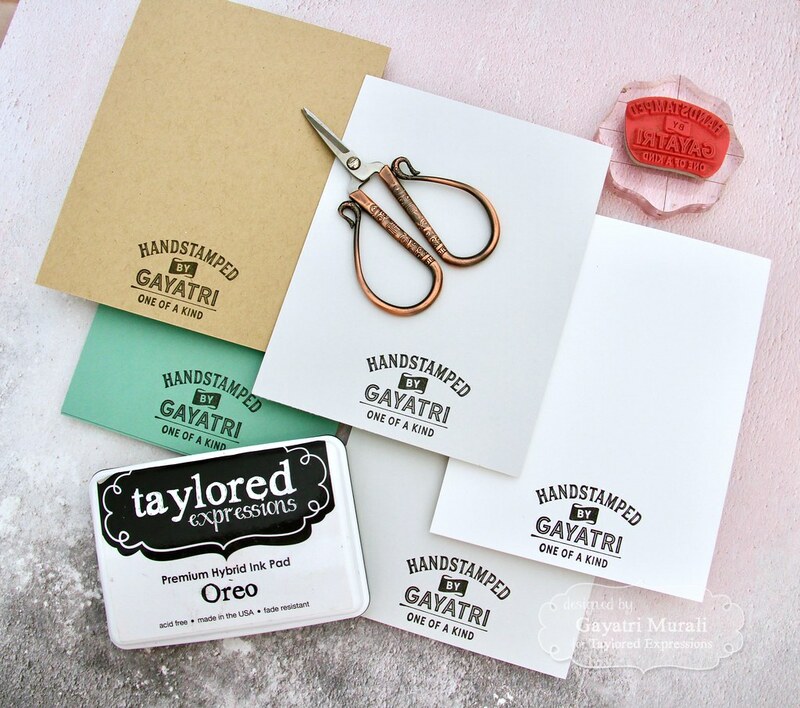 At Taylored Expressions this month we, the designers are showcasing mass producing cards. 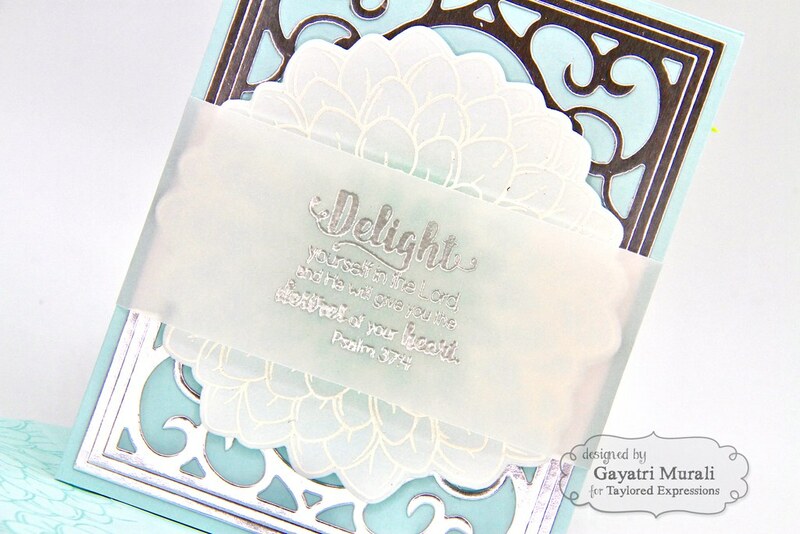 I am sharing a set of four cards using Big Blooms stamps and Be Still sentiment stamp set. I also coordinated the envelopes. 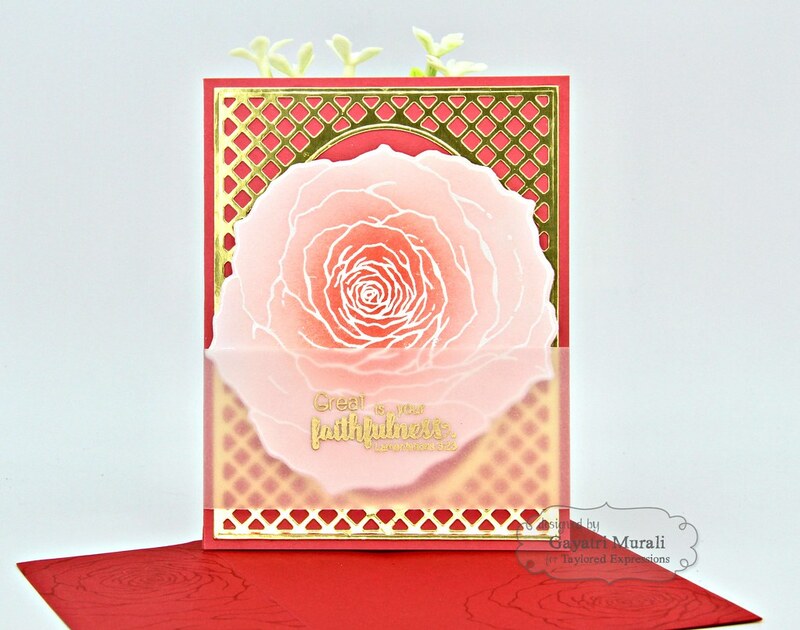 I also used Lattice Frame cutting plate to add layer and texture to the cards. These are simple, easy to make but colourful and packs a punch. Here is the full set of cards. So I decided to make a set of two warm and two cool coloured cards. Or you could also says two bright and two pastel coloured sets. The process and layout is the same for all the four cards. But the colours, flowers, cutting plates, foiled cardstocks and sentiments are different. 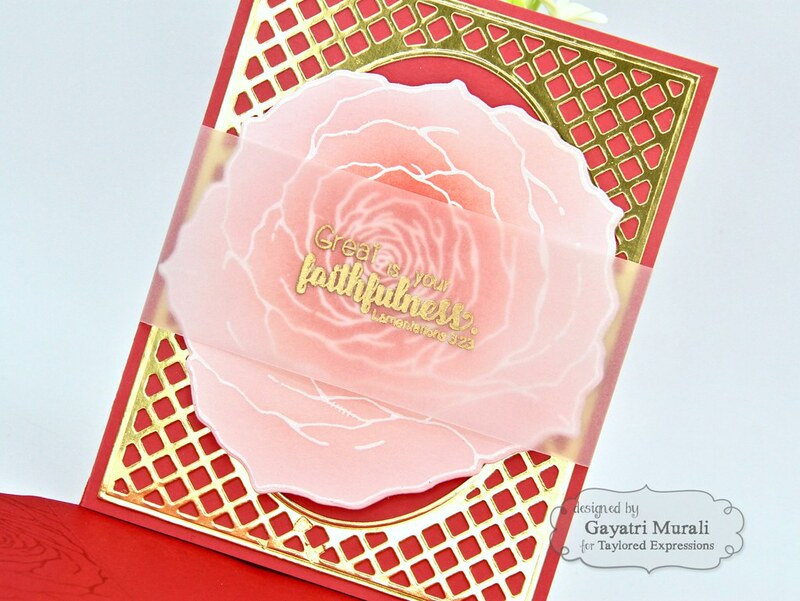 For the bright/warm coloured set of cards, I used Lattice Frame cutting plate die cut in gold foil cardstock, Big Blooms Rose and Big Blooms Daisy stamps on Guava and Pineapple card base. 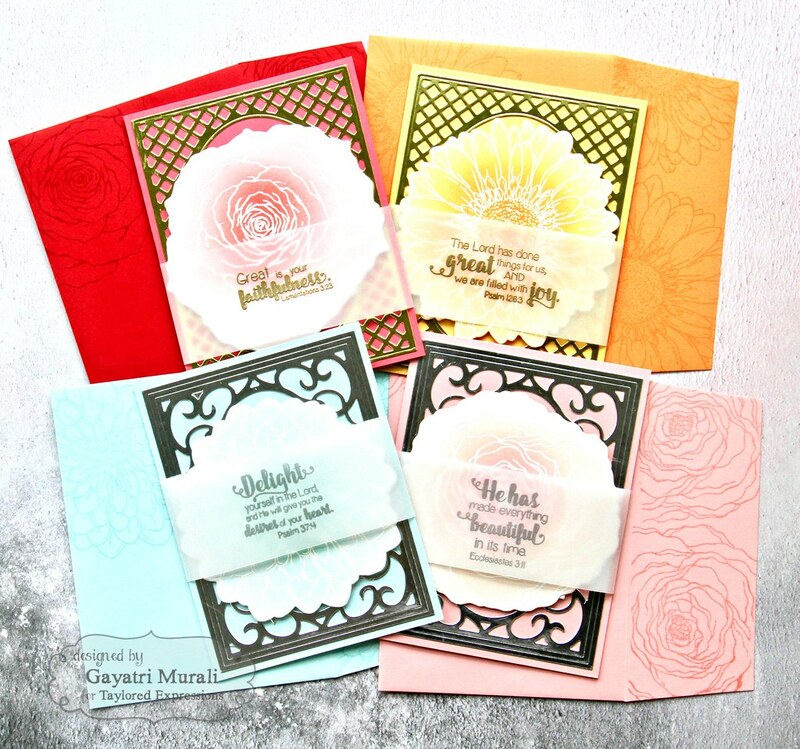 So I white heat embossed the Big Blooms flowers on Sugar Cube cardstock, die cut them using coordinating dies, then sponged distress inks in Abandoned Coral, Spun Sugar on the rose and Spiced Marmalade and Dried Marigold distress inks on the daisy in ombre to get depth on the flowers. 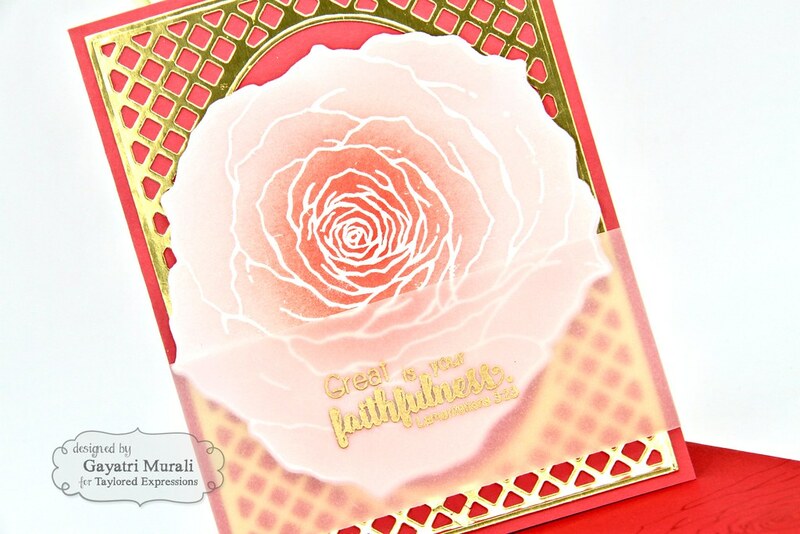 I adhered the cutting plate die cut on the card front, then the Big Blooms flowers die cut using foam adhesive on the centre of the card front. The sentiment is a wrap actually. I used TE vellum cardstock trimmed to three inches to eight and half inches long. I gold heat embossed the sentiments from Be Still stamp set on the centre of the vellum strip and wrapped around the card and glued the back of the vellum strip. So this sentiment vellum strip slides out to open the card. 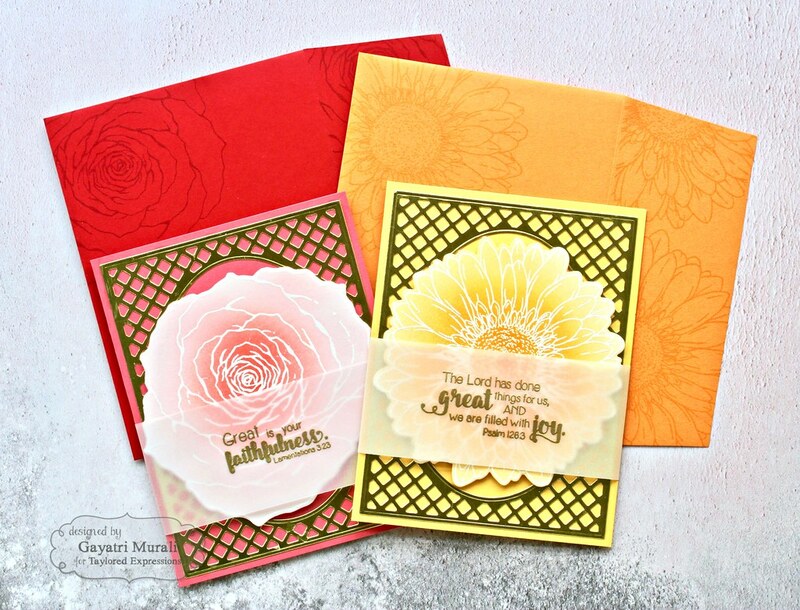 I stamped the Big Bloom Rose and Daisy image in coordinating tone on tone colours on the Cherry Pop and Candy Corn envelope both on the bottom of the envelope front and on the back flap. 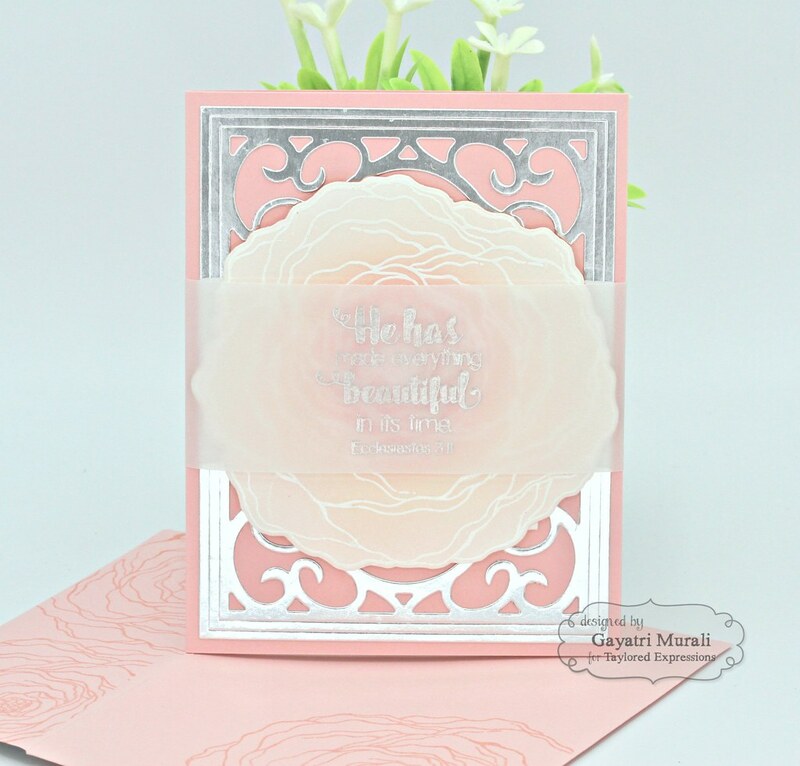 The pastel/ cool card set is very similar to the previous set except the use of pastel colours combined with silver foil and embossing and different Big Blooms flowers. So the card bases are Pink Champagne and Sprinkles cardstocks from TE. The Big Blooms are Cabbage Roses and Zinnia which is white heat embossed on Sugar Cube cardstocks and sponged with Spun Sugar and Tattered Rose distress inks on Cabbage Rose and Tumbled Glass and Salty Ocean on the Zinnia. 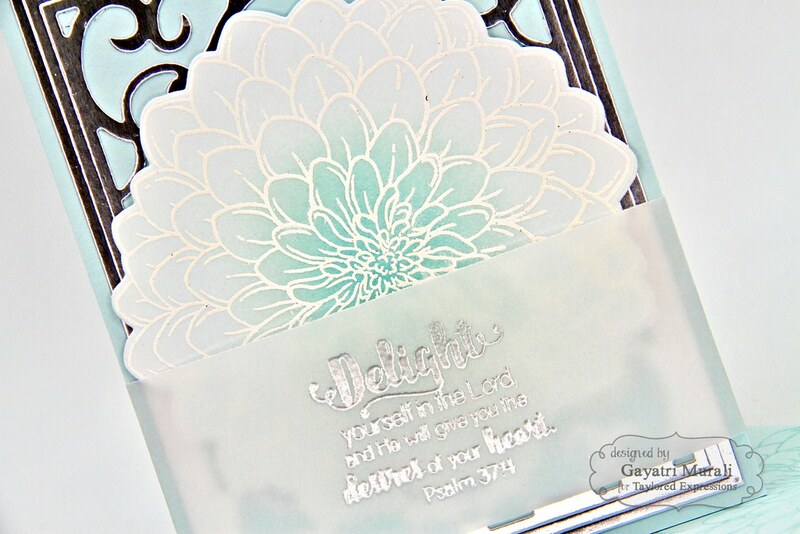 Both are die cut using coordinating dies. 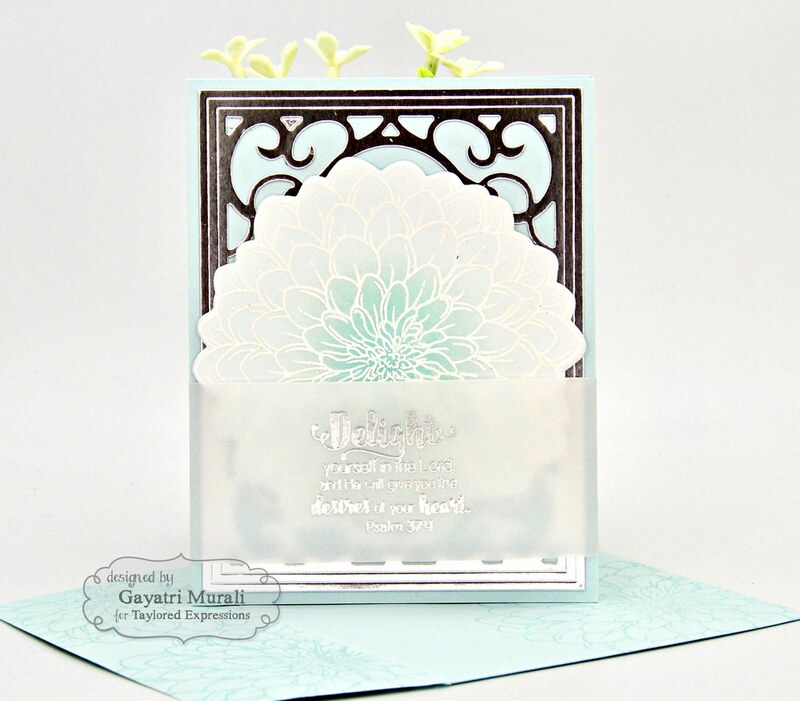 The cutting plate used on these two cards are Ornate Frame cutting plate die cut using TE silver foil cardstock. 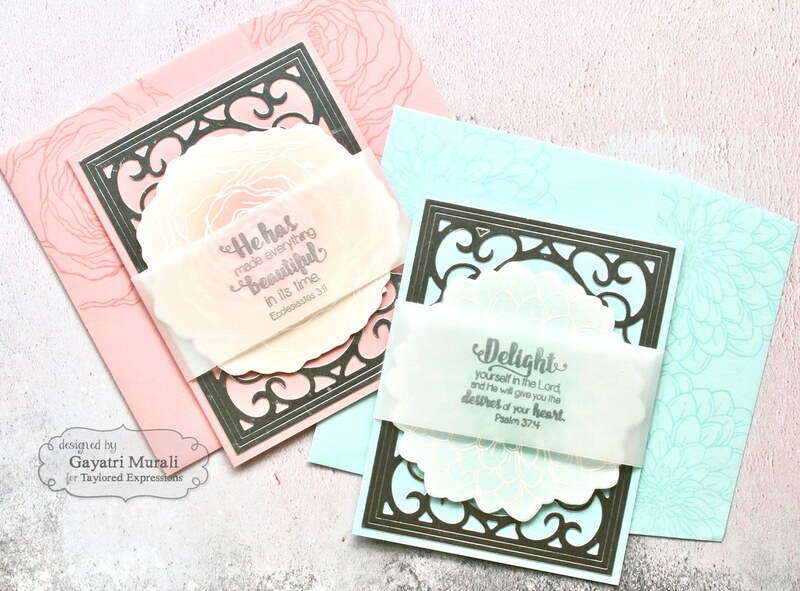 Similar to the previous set, the sentiments from Be Still stamp set is silver heat embossed on vellum strip and wrapped glued around the card. 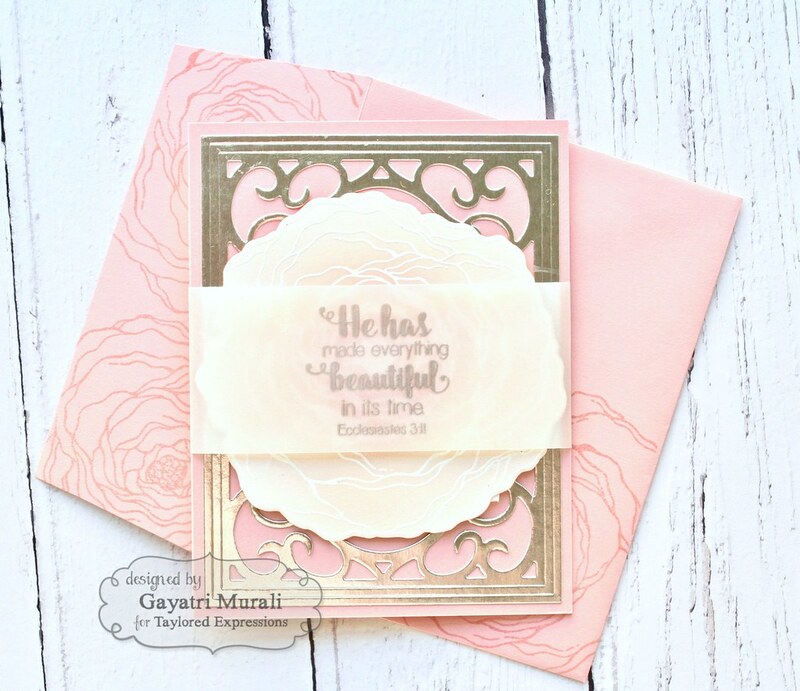 And again, the Pink Champagne and Sprinkles envelopes are stamped with the coordinating Big Bloom flowers using tone on tone inks. So this is my set of mass produced cards with layers, colours, texture yet simple and easy to make plenty of them. These cards are beautiful in real. 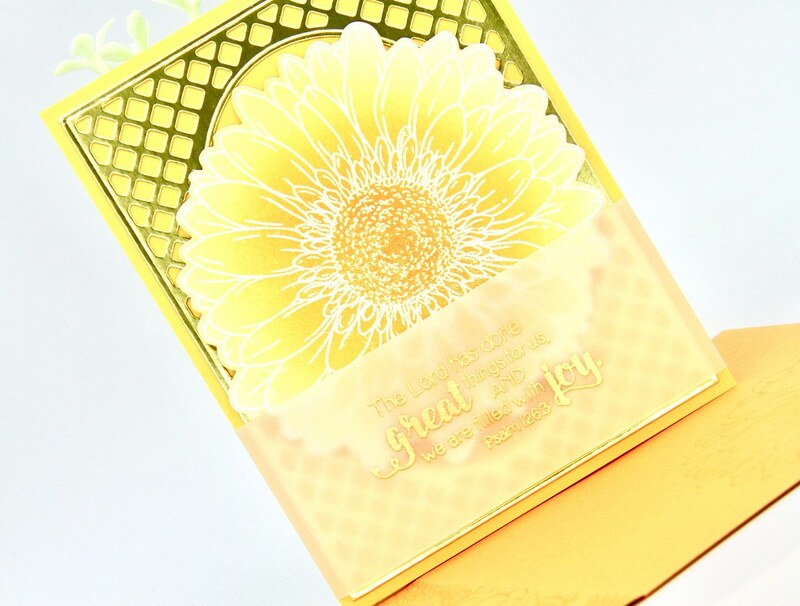 Photographing the foil cardstock is hard. The photos don’t do justice to the real cards I tell ya. Hope you like them and find inspiration to make your own set. 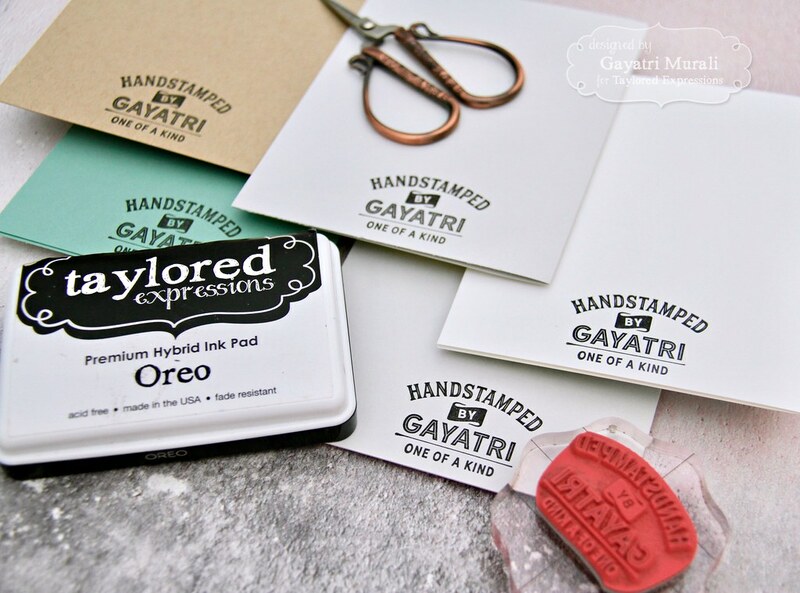 Did you know Taylored Expressions has “Handstamped by” stamp from their Personalised Pop Up Shop? But it is for a limited time only. See the graphics below. Aren’t they gorgeous. It makes me proud to stamp on the back of all my cards. There are four designs offered. But be quick, the pop up shop is only until Feb 3rd.